I'm (nearly) ready! Lapinity will be opening in its new home on Monday, April 27, with a variety of options, including some rather beautiful pre-mounted offerings ready to hang, as well as simply the prints themselves. Publicity and orders will both be welcomed. ^_^ For now, you can see how it'll look, but with no ordering enabled. Oh, this looks like it could be seriously good. 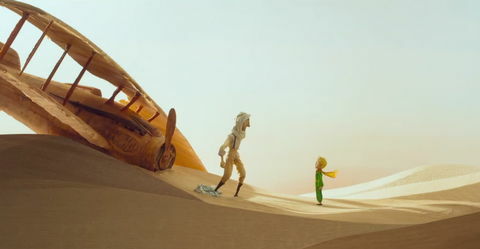 =:D The first trailer for The Little Prince, by Antoine de Saint-Exupéry, has just debuted. 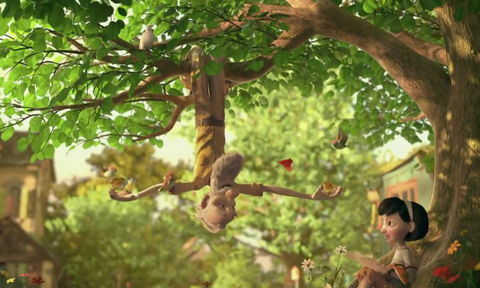 Quite a surprising director, too, having previously helmed Kung-Fu Panda. Curiously, they've chosen to bracket the story within another, a conceit reminiscent of The Princess Bride. Well, that's an interesting change of career.. Scott Forstall, one time iOS chief, just announced he's co-producing a Broadway adaptation of Fun Home, based on Alison Bechdel's graphic novel of the same name. Did you know there was almost a 1990s cartoon series of Doctor Who, produced by Nelvana? Sadly, nothing came of it - supposedly, another bid came in and detracted from the attention given here, with it all petering out. If you enjoy Star Trek, you might derive much geeky delight from this comparison of ST:TMP script revisions that jenndolari's compiled. It's presented as a tall webpage of seven columns, one for each revision noted, going through the progression of the film - as you might expect, in some versions, particular scenes don't appear at all, or with significant differences. I was tickled to see one story treatment tagged as "First draft script ostensibly written for the new Star Trek Series, Star Trek II, but, known only to the core production staff, was written as the rough draft for a Star Trek movie." Ah well - looks like the Fursuit mailing list just got wound up, going by the auto-unsub I received. (And yep, it's confirmed on the site) It had a pretty good run of things, given it was born around 1992, the result of a discussion Malin, Frang, and I were having whilst waiting for a Timberwolves game to begin - Frang was talking about a program he'd written to help calculate the weights required along a fursuit tail in order to afford it some realistic swishiness, purely passively. I wound up thinking it'd be really helpful to have a venue to be able to share thoughts and plans like that, and so, rcking foolishl^Wnobly volunteered to set it up. That was an unusual moment, on Saturday afternoon's rabbiteering - rather wish I had a headcam operating. =:) There'd been some unusually prolonged chasing going on, with them eventually diving into a corner of the field I can't see, but close to me. A minute or so later, the chased bun comes wandering along, in no particular hurry, and ambles right past me - maybe only 5' away from me! It was only when I turned around to start taking shots that they had their #ohshit moment, and started hurrying away. Actually quite a good day, overall - they were quite active, with one or two couples in evidence, though the tinybuns did unfortunately remain close to the hedgerow at the other end of the field, and no binkying. Of course, you can never tell, from one day to another, what the activity level's going to be like. 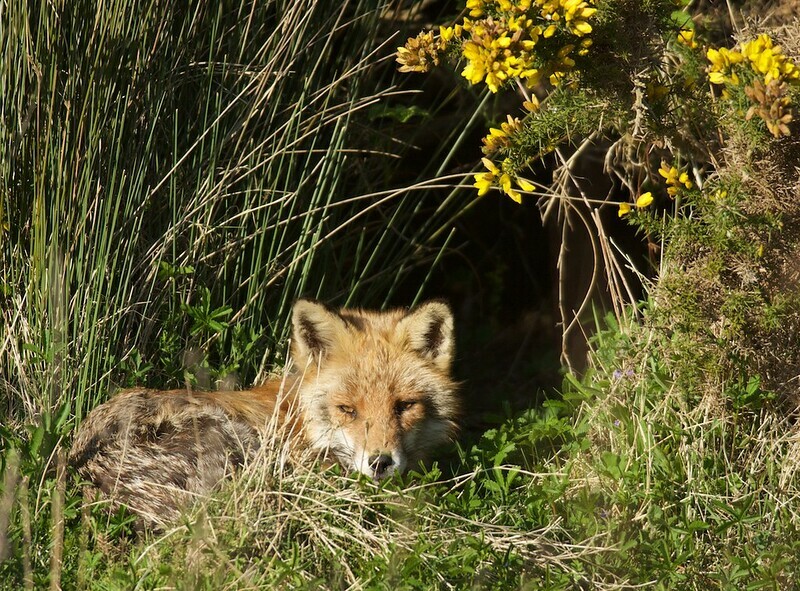 Foxes tend to sleep most of the day, except for a little bit of activity during late daylight to patrol. (And sunbathe.) They hunt, scavenge and forage (mainly forage if anywhere near urban areas) during the night. The British fox probably does very very little hunting these days, as they will cache supplies they forage, or scavenge road kill, and are quite happy to move between towns. There's actually no distinction between an 'urban' and 'rural' fox in the UK since their territories are not as fixed as we once thought, and they're highly migratory. Basically, all British foxes have evolved to be able to survive, and thrive, with occasional visits to urban areas. Ahh, interesting! Certainly, there's plenty of territory for them to explore thereabouts, with some open wetlands, fields, and some small towns, so if they do choose to go wandering, they'd have a choice of relatively easy urban pickings, with the associated traffic risks, and the gentler countryside. I was quite surprised they didn't seem particularly bothered with me being there - I was about 40' away, if the D7100's distance estimation is to be believed, in perfectly open view. But, if the rabbits can get used to the cyclists and walkers along the trail, I'm sure foxes can as well. Anyhow — it may be defunct now, but it had a great run and lasted longer than I'm sure anyone expected in 1992. And fursuiting itself is obviously very much alive, now more so than ever, so I prefer to think of the list as not being dead, but rather as having succeeded in what it set out to do, and as retiring from active service now that there is a plethora of ways for fursuiters to communicate. I'm hardly an expert on foxes, but I think it's fairly normal for any animal to lounge and relax for a while when there's nothing that needs attention – no rumbling tummy, no attractive females (or males) in the area, no potential threats, you get the idea. Oh, crikey, that restriction! Gods, yes, I recall something about that.. I think the reasoning was to try to keep the SNR high, to keep discussion on practical matters of performance and construction. Of course, there's hardly any means of verifying anything like that. =:/ In hindsight, I think a completely open policy may have been better, but with moderation in evidence, to ensure matters stayed relevant to the list. Certainly, there were far fewer furry communications options then - alt.fan.furry and alt.lifestyle.furry for daily chatting, tezuka.rest.ri.cmu.edu for furry imagery, a few BBSs, and a couple APAs, notably Rowrbrazzle, later joined by Furthest North Crew. Oh, yes, nobody attempted to verify it. And it would've been hard to do so, anyway; basically you'd have had to take people at their word. It might be possible to ask for some evidence that someone made a suit, but that someone wore a suit? Not a chance. So it was really one of those things that was good at keeping honest people out while not being in any way effective against dishonest ones. (Life's full of things like that.) Yeah, a completely open policy would've been better. Let interested people join, and if somebody's causing problems... well, you can deal with that when it happens. Ah, I don't recall Tezuka, that must've been before my time; when I got into furry fandom, Avatar and VCL reigned supreme (and FurNation, to a lesser extent, and Yerf). Looking it up I see it was run by Shaterri, though — now that is a name I do recognize! I believe I may have run into him on FM, and I recall some rather cute art of his personal furry that another FM Wizard drew. :) Never knew him personally either, though. It's just a bit of a pity there isn't really any particular successor, so much as a sprawling mass of individual makers and performers (wow, that sounds gruesome =:). Yeah, there is that. Well, there's fursuit, at least — and timduru's archive and FursuitDB, of course. I know what you mean about having a single central place where discussion etc. can take place, but honestly I think fursuiting's gotten too big and popular for that. Re: newsgroups, BTW, since you were probably around at the time, when was the fur. * hierarchy conceived? I never was on the furry alt. * groups, but kept an eye on Furrynet. Hm! I'm not sure about fox predation. I suspect their sole enemy at this point, given wolves and bears are history in the UK (though I recall seeing some intent/hope to reintroduce wolves), is probably hom.sap., though the ending of foxhunting has probably seen a big improvement on that front, even if such activities do persist. Seeing wolves in the UK again would be nice, too. When did you last have any? Watched the season opener of MLP, and.. erf, that was an awkward one. Actually, that's a good point.. yes, they'd gone along with it entirely (well, maybe largely) willingly - though, I'd have expected the smiles to be more sincere, with cultists. But, I suppose the line starts to blur before long - once a unit (whether a cult camp, or even a country) like that's solidified, even if you want out, you know most of the others don't, and will happily ensure you're brought back into the fold, or eliminated, as per that neo-religious bunch of nutters based on a bad science fiction writer's work, or extremist political groups like the Khmer Rouge, or the North Korean dynasty. .. did I just touch on North Korea in discussing My Little Pony? Anti-diversity, yes - that's the key. It wasn't until later on we got to see just what the baker (was she ever given a name?) could really do. I'm no master chef, but I know I'd've found that loss of ability quite heartbreaking. Surely others would've felt that, on balance, things were now worse? Still, perhaps it all comes back to the tipping point above. Thanks for the links as ever! I don't remember the human element as much as the fantasy element of Little Prince... not bad though..
That was the season opener ah? Someone sent m the link so I watched it yesterday too! I am, though, an absolutely terrible judge of what others will find wonderful. ^_^ I'm quite a fan of Jupiter Ascending, f'rex, whilst there's rather a touch of hate to be found for it. I may give the opener another try sometime soon. ^_^ I certainly don't believe they intended it to be anti-egalitarian, but.. it brushed rather close to that for me, when I watched it. I presented my database to the school board and some members of the foundation trust in Albuquerque Thursday. Heading home we stopped at a restaurant/pub in Socorro, that's where the Very Large Array of radiotelescopes are (you can't see them from the highway, you have to drive specifically to them and they are quite awesome). The restaurant had a wood-fired oven: I got double pepperoni, bacon and onions. I didn't eat it all, and I inadvertently left the two final pieces at the restaurant. Not a happy camper. But at least I know a pretty good place in Socorro since our previous really good place closed. And the demonstration went excellent, with the exception of one code bug and a timer set to auto-close a form being set too short for a demo. They understood that the system was not yet in testing, so bugs weren't a big deal yet. 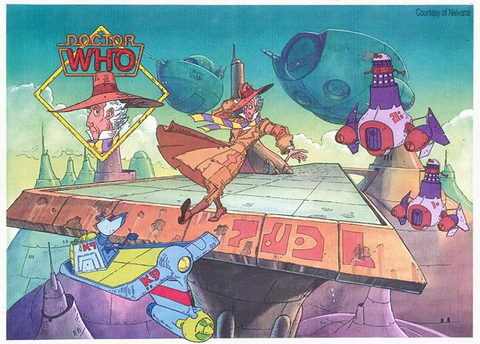 Oh wow, that aborted Doctor Who cartoon just screams MOEBIUS at me! It would have looked AMAZING! Doesn't it just? =:D FSM, if I had the money of Tim Cook or Elon Musk, I'd be personally sponsoring amazing projects like that. FSM knows, even a lavish production's only a million or two per episode. I really enjoyed Jupiter Ascending. It pushed all my Dune/Heavy Metal/Flash Gordon buttons. One of the promo poster even looked like Druillet's art style! It's almost like you need to grow up European to enjoy classic pulp sci-fi these days. What an adorable fox you captured :p those fluffy ears are just too cute. How do you capture all these moments, I mean, do you make camp somewhere and wait until animals come closer? Your website looks good! You got beautiful pictures on there.